Thank you for visiting Eye Candy Creative Studio's Shop on Etsy! 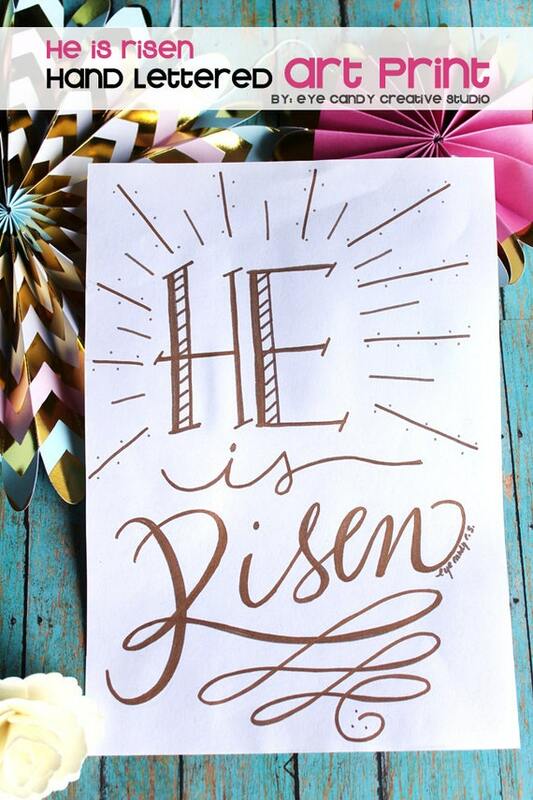 "HE is Risen" Easter Digital Art Print. This listing is for a hand lettered quote design, done by me. I have hand drawn, hand lettered this quote & then scanned it in to provide to you as a digital print that can be emailed right to your inbox! This will look amazing framed & placed on the wall in a studio, living room and more. Would be great to give as a gift. - Print is designed as a 8 x 10. Files will be sent to the email address provided on your Etsy account within 1 business day-once we receive payment. (closed on weekends) Files can not be edited before printing. Please contact us for customizing of ANY of the items in our shop for an additional charge. Eye Candy Creative Studio is on FACEBOOK!